The most interesting game was a derby match between two local teams from Alger: NAH Dey (#8) and GS Petroliers (#7). NAH Dey (9-8) won against visiting GS Petroliers (10-2) 82-67. NAH Dey maintains eighth position with 9-8 record. 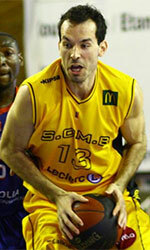 Defending champion GS Petroliers keep the seventh place with two games lost. NAH Dey are looking forward to face OS Arreridj (#9) in the next round. GS Petroliers will play against Olympi Batna and are hoping to win this game. Very important is a home loss of third ranked IRB Arreridj (13-4) against ninth ranked OS Arreridj (9-9) on Wednesday night. Host IRB Arreridj was edged by OS Arreridj in a tough game in B.B. Arreridj 80-81. Newly promoted OS Arreridj maintains ninth position with 9-9 record. IRB Arreridj at the other side keeps the third place with four games lost. OS Arreridj will play against higher ranked NAH Dey (#8) in Alger in the next round and it may be quite challenging game. IRB Arreridj will play on the road against USMB (#6) in Blida and hopes to get back on the winning track. Leader CRB Dar El-B. delivered the fifteenth victory on Wednesday night. This time they crushed 10th ranked USM Alger (7-10) 87-57 in El-Beida. CRB Dar El-B. (15-2) have an impressive seven-game winning streak. They maintain first position. Newly promoted USM Alger keeps the tenth place with ten games lost. They share the position with El Eulma. CRB Dar El-B. will meet GS Petroliers (#7) in the next round where they are favorite. USM Alger will play against the league's second-placed USS and hope to secure a win. The game with biggest result difference took place in Boufarik. Local WA Boufarik (13-5) outscored 15th ranked RC Constantine (3-14) 68-36. WA Boufarik have an impressive five-game winning streak. They maintain fourth position with 13-5 record. RC Constantine lost fourth consecutive game. Newly promoted team dropped to the fourteenth place with 14 games lost. WA Boufarik's next round opponent will be bottom-ranked Olympi Miliana (#16) on the road which should be another easy win for them. RC Constantine will play against Olympi Batna and it may be a tough game between close rivals. Constantine JP was crushed by El Eulma in Eleulma 73-51. Olympi Batna smashed Ouargla at home 78-56. Olympi Batna was destroyed by US Setif on the opponent's court 88-64. Staoueli managed to outperform USM Blida in a home game 81-70. There was no surprise in Eleulma where 14th ranked Constantine JP (3-14) was crushed by twelfth ranked El Eulma (7-10) 73-51. El Eulma moved-up to tenth place, which they share with USM Alger. Constantine JP lost eighth consecutive game. They keep the fourteenth position with 14 games lost. El Eulma's next round opponent will be Ouargla (#13). Constantine JP will play against Staoueli and hope to win that game. No shocking result in a game when eleventh ranked Olympi Batna (6-11) smashed at home 13th ranked Ouargla (4-14) 78-56. Despite that victory Olympi Batna went down to twelfth position due to points difference. Ouargla lost seventh consecutive game. They keep the thirteenth place with 14 games lost. Olympi Batna's next round opponent will be higher ranked GS Petroliers (#7) in Alger and they do not belong to the favorites in that game. Ouargla will play at home against El Eulma (#10) and hope to win that game. Very expected game in Setif where 11th ranked Olympi Batna (6-11) was rolled over by second ranked USS (14-3) 88-64. USS have an impressive five-game winning streak. They maintain second position with 14-3 record behind leader CRB Dar El-B. Olympi Batna at the other side dropped to the twelfth place with 11 games lost. USS's next round opponent will be USM Alger (#11) on the road and are hoping to win another game. Olympi Batna will play against GS Petroliers in Alger and hope to win that game. The game between closely ranked teams ended with fifth ranked Staoueli's (11-6) home victory over 6th ranked USMB (11-6) 81-70. Staoueli maintains fifth position with 11-6 record, which they share with USM Blida. Staoueli's next round opponent will be Constantine JP (#14) and are hoping to win another game. USMB will play against IRB Arreridj (#3) and it may be a tough game between close rivals.